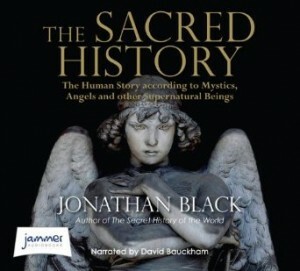 Review of “The Sacred History: How angels, mystics and higher intelligence made our world” by Jonathan Black. Quercus Editions 2013. This book is about angels, demons, gods, magic, giants, fairies, miracles and other such things. These appear in many folk stories, fables and myths, some found in sacred writing, others passed on by word-of-mouth. Jonathan Black’s style of writing is easy-going and gets our attention. He points out that the sheer volume of stories of this type is remarkable testimony across the ages to the reality and experience of a non-material realm. Those of us who sometimes have had intimations of something beyond the physical life will be drawn to this. The author claims that legends can convey wise lessons for us all. For example he says that the passion of Venus for Adonis shows that desire can sometimes be destructive, that the Norse Lucifer, stealing a magic ring, reveals that even the best of us can become acquisitive and selfish, and that, because of the sun god, if we act wholeheartedly and risk everything, we can ultimately defeat the forces of darkness. Not only do we get a full narrative of over forty stories together with insightful comments, there are many background notes for those who wish to explore the material further. This includes stories about guardian angels, Hitler and the Hungarian angels, and the angels Michael, Gabriel and Raphael. The world of imaginative fiction engages our interests and emotions. Our involvement in a novel comes from the way the dynamic of plot links with the way we identify with the aspirations, and failings of the protagonist. But according to Jonathan Black the stories in The Sacred History are not truly fictitious but are enactments of what has happened in a veiled spiritual world unseen by our physical sight. And so he argues that they resonate today because they not only connect with the deeper side of personal experience but also help us to see the unconscious operation of an unseen realm in our lives. The author accepts the esoteric idea of a correspondence between the celestial and natural worlds as expressed in the hermetic axiom “as above, so below,” and the importance of imagination linking the two. I like his idea that there is a correspondence between all parts of the visible and invisible cosmos. Whereas the mystic typically seeks a direct and immediate union with the Divine Source without any intervening images, many esoteric thinkers, such as the author, have tended to focus on intermediaries, such as angels, thus focusing on the persona and events of myth. I take this to mean that they are concerned with the symbolic meaning of the drama. I would say, speaking from a Christian religious perspective, a lot of the Bible contains valuable spiritual truth which can guide our lives but this is often veiled in myth which in the literal sense at times can be off-putting and gruesome, because it is dealing with the darker side of human nature. The esoteric writer Emanuel Swedenborg claims that ancient people had an appreciation of a correspondence between the outer literal sense and the inner noble meaning of sacred stories: but as humankind gradually fell away from a spiritual and humane way of living, it began to lose this knowledge. He thought that, with this general spiritual decline, the images denoting things in the world corresponding to heavenly things, were turned into legends which reflected a distortion of authentic truth e.g. the attributes of the one divine God came to be seen as different gods. Nevertheless, it is suggested that a certain remnant of the ancient knowledge remained in the pagan stories, illustrated by Paradise, the great flood, the sacred fire and the four ages. One problem is if we are to consider the mythical elements portrayed as symbolic, giving us access to deeper understanding about life, does this mean that miraculous happenings and beings such as angels are purely fictitious? It has been thought that when stories are taken to be literally true then this is to suffer from a “disease of reason.” However, Jonathan Black writes that the stories work on different levels and that we should not get hung up on the literal meaning but rather on the deeper message. In these narratives, many of the angels do not incarnate in human form and gods are shown as often behaving immorally. The Sacred History appears to accept the notion that angels are indeed sexless beings and an additional form of creation to human beings. An alternative view is that angels were first born as human beings in the physical world and, following a process of spiritual growth, after death exist as the spirits of either men or women who once lived on earth. According to this way of thinking, the forces of darkness comes about from human opposition to all that is good and true and so an evil figure such as Satan that we find in the stories did not exist before creation and neither do badly behaving gods. I think the author is right to suggest that we are all prone to the illusion that our outer sensory experience of the world is more real than the mental world of spirit. He claims that what are described are dramatic events that did not actually happen in the physical world but rather in the hidden spiritual world; thus giving us a new way of looking at history that no academic historian or archaeologist could fathom. When we read mythical stories we enter a mysterious place full of paradox and enigma, not easy to interpret. It is one thing to have subjective experiences which are meaningful to oneself, and quite another to have something to say which communicates in a rational way to others. Different people may project their own needs and preconceived ideas onto the material. You will have to make your own mind up about whether the stories do reveal what is claimed in the book about a meaningful history of spiritual reality and wisdom.